6/4 Cup of Coffee: Pawtucket, Portland and the DSL Sox all fell on Tuesday. Salem snapped out of a funk with a victory as Greenville got a stellar performance from their starter to join the winner's circle. Pawtucket dropped their fourth game in a row, 5-2 to the Durham Bulls (TB). The PawSox have now dropped 16 of their last 21, falling to last place in the International League North division. 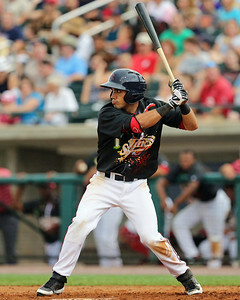 Top prospect Mookie Betts made his Triple-A debut, going 0 for 4 with a walk. Corey Brown had a solo home run in the fifth and an RBI ground out in the sixth to account for both Pawtucket runs. Chris Hernandez fell to 2-6 on the season for his 5 1/3 inning effort, allowing five runs (two earned) on four hits and a walk, striking out four. In a game that saw 34 hits, Portland could not keep up with the Erie SeaWolves (DET), losing 11-9. Sea Dogs starter Mike Augliera had his ugliest start of the season, allowing seven runs (six earned) on 11 hits and a walk in just four innings of work. Wilfredo Boscan received the loss for his 3 1/3 innings of relief work, allowing four runs (three earned) on eight hits and a walk. After going down 1-0 in the first, Portland scored three times in the bottom half of the inning on RBI doubles from Sean Coyle and Keury De La Cruz in addition to Deven Marrero scoring on a catcher's interference call. Marrero and Blake Swihart each added an RBI double in the second inning to give the Sea Dogs a 5-1 advantage. Erie would storm back in the fourth, knocking around Augliera to take a 7-6 lead. Portland responded immediately in the bottom half of the fourth, getting a solo home run from Swihart, a sacrifice fly from De La Cruz, and an RBI single from Derrik Gibson. Although the big inning gave Portland a 9-7 lead, they would be held scoreless the rest of the contest as Erie eventually tied the game in the sixth and took the lead in the eighth. Marrero and Coyle each had two doubles. Swihart had a double, home run and two RBI. De La Cruz had two hits for the second consecutive game since his season debut on June 1st. Salem's offense mounted a late game comeback as they eclipsed the Fredrick Keys (BAL), 6-4. Corey Littrell pitched well in six innings of work, allowing three runs on seven hits, walking none and striking out nine. Kyle Martin picked up the victory for his three innings of relief, allowing an unearned run on just one hit. Fredrick held a 3-0 lead until the fifth, when Carson Blair delivered an RBI single that plated two. The Keys would extend their lead to 4-2 in the top of the seventh, but the Red Sox retaliated with three runs of their own on an error and an Aneury Tavarez RBI double to take a 5-4 lead. Dreily Guerrero added a solo home run in the eighth to provide the Red Sox with a key insurance run. The victory snapped a six game losing skid for Salem, who currently sit in second place in the Carolina League's Northern division, 10.5 games behind first place Myrtle Beach (ATL). Solid performances from the top of Greenville's order in addition to solid pitching allowed the Drive to clip the Lexington Legends (KC), 3-1. Trey Ball turned in his best effort of the season, hurling five shutout innings, allowing just four hits and a walk while punching out three. Jacob Dahlstrand picked up the victory for his four innings of relief, allowing one run on three hits and a walk. The game remained scoreless until the sixth, when Carlos Asuaje (pictured, above) laced an RBI triple that brought home two. After Lexington picked up a run in the seventh, Asuaje responded in the eighth with an RBI single, giving the Drive a 3-1 cushion. Asuaje was the star for the Greenville offense, going 2 for 4 with a triple and three RBI. The DSL Red Sox dropped their first game of the young season, 6-3, to the DSL Nationals (WAS). Emmanuel De Jesus was knocked around in his 3 1/3 innings of work, allowing four runs on six hits and a walk, striking out five. Alegnis Martinez added 3 2/3 innings of relief, allowing two runs on four hits and a walk, also striking out five. Rafael Devers and Juan Hernandez led the Red Sox offense, each collecting two hits and an RBI in the loss. Player of the Day: Carlos Asuaje was a primary factor in Greenville's 3-1 victory over Lexington. The 22-year-old third baseman went 2 for 4 with a triple and knocked in all three runs. Asuaje, who was an 11th round selection in last year's draft, has put together a stellar sophomore season, hitting .309/.429/.539 with four home runs, eight triples, 13 doubles and 39 RBI in 52 games. He has really been a terror against right-handed pitching this season, hitting .338/.459/.632, a huge improvement over his .214/.327/.238 line against southpaws. His big day at the plate followed an announcement that he would be a member of the 2014 South Atlantic League All-Star squad.